Cats are narcissistic little creatures. They like to look good. They like to feel good. They were made to look good. They have skin and coat, which requires regular cleaning in order to maintain good health and condition. I can pretty much bet that not a single cat on the planet would choose to be matted, pelted, flea-infested or have dried excrement stuck to its hindquarters, if offered the choice. 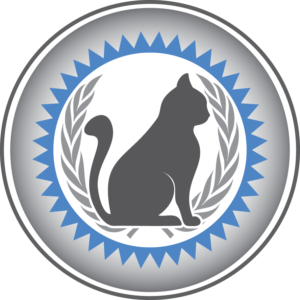 Understanding a cat’s reactive nature and disposition, as well as its individual skin and coat needs is the first step in providing humane treatment. Some believe that bathing a cat is inhumane, particularly if the cat is being disagreeable to the grooming in any way. But I believe that not bathing the cat (unless there are unusual, extenuating circumstances) is the inhumane option. Let me explain. These clumps are created by dead undercoat matting together with greasy oils from the cat’s skin. This will need to be shaved off gently as this is an older cat with fragile skin. Cats have skin and coat, which needs to be cleaned and degreased. Cats are no different from a person or a dog or a horse. All need to be regularly bathed/cleaned. No bath = more grease, more filth, more hairballs, more mats, and unsanitary conditions overall. Cats have greasy skin and coat. Grease causes the hair to stick together rather than fall away during the shedding process. This, in turn, creates a tangle – or many tangles. And tangles grow up to be mats. Mats, if left alone for a time, will turn into a pelted mess. Tangles, mats and pelts must be removed, and the act of doing so is painful, or highly uncomfortable at best. Cats have hair that sheds and will also felt together into a hard knot if left to air dry. The shedding hair, if not removed on a regular basis, contributes to the matting/pelting process. 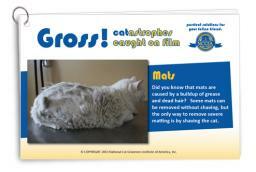 Shedding hair is also the root cause of hairball problems, which are disgusting and bad for a cat’s health. And wet cat hair does felt! I can prove it. If you’ve ever seen the cat hair handbags I used to make back when I had more time for such things, you will know what I’m talking about. I’ve intentionally felted cat hair yarn to make these handbags. It felts easily (and rather tightly) simply by getting it wet and then letting it air dry. Bathing a cat and then not thoroughly drying it will produce the same results. Only, in that case, it is still attached to the cat, thus making the removal process a painful experience for the cat. Mats are not good for a cat. 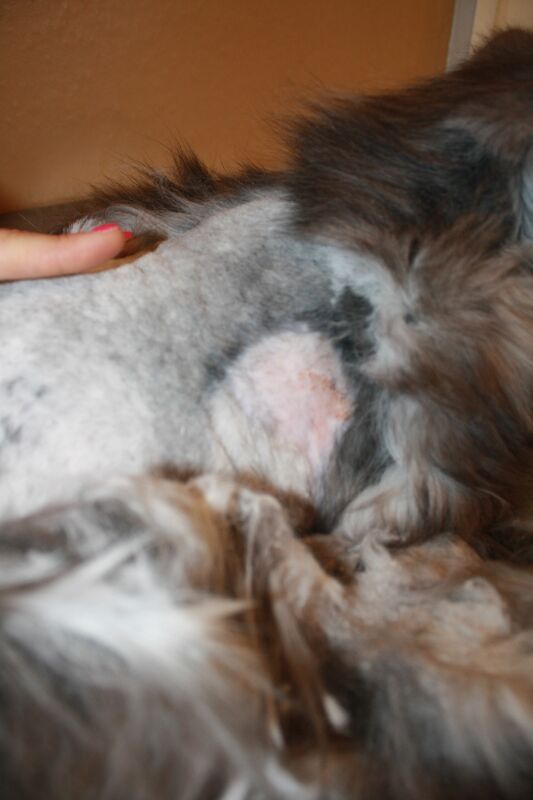 Matted, tangled, or pelted hair creates discomfort, sores, infections, and even death. A pelted cat that cannot freely move about or potty because of blockage will die a miserable death. Even if none of the above occurs, the necessary removal of the pelts or mats causes undue pain and suffering for the animal. Prevention is always best. Prevention is the humane choice. Mat removal, although necessary when matting and pelting become a problem, is never the preferred course of action. Mats MUST be removed to avoid eventual death. Whether this is done with clippers or during the drying process with a comb, is determined by several factors including the severity of the mats, the skin condition of the cat, age and health of the cat, and the cat’s temperament. When severe matting or pelting is present, shaving becomes the only option for removal. 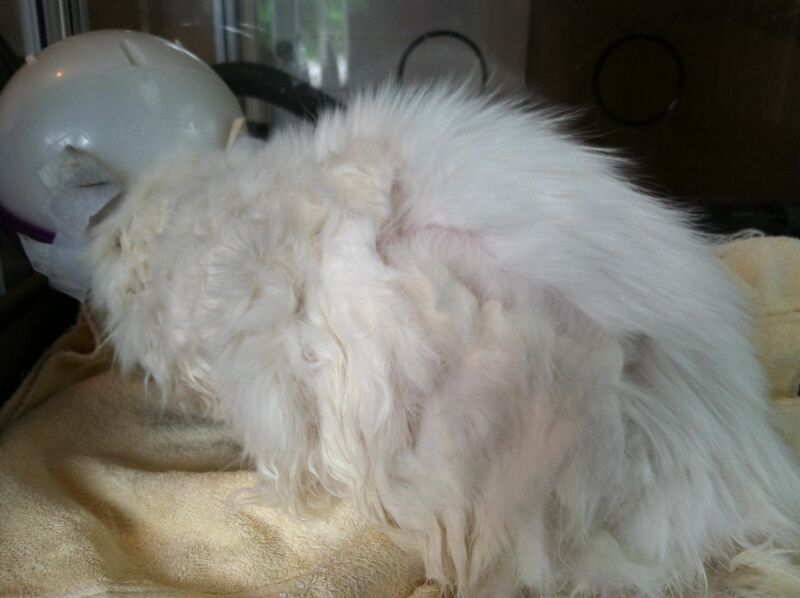 Shaving, for cats with certain skin or health conditions or those of an aggressive nature, is very dangerous. If it is the only option for rectifying the situation, it must be done. But it should only be done ONCE (because it has to)! Prevention is the key from that point forward. 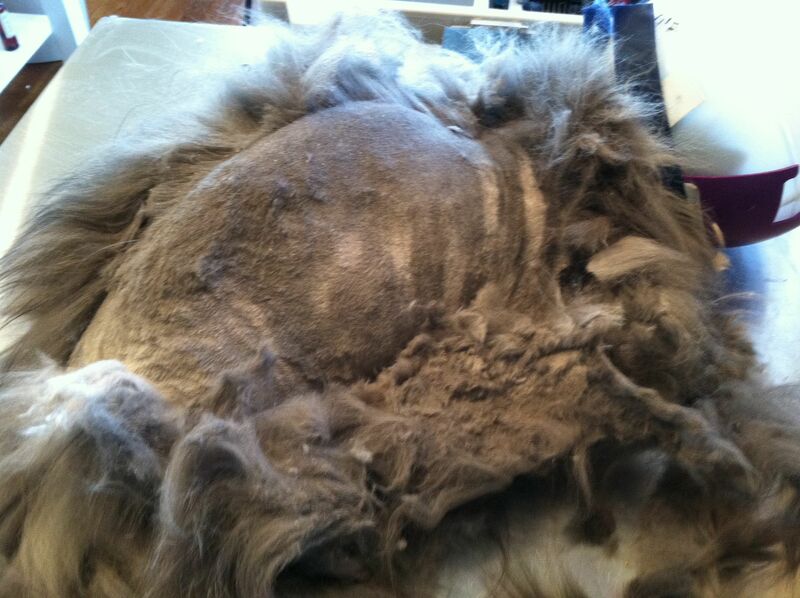 A longhaired cat in the middle of its matted pelt removal by a professional cat groomer. Look how tightly the hair is matted together. Cats generally hate the process of having their hair ripped out by way of a comb or brush. If a cat is already stressed or on the defensive, it will only become more agitated by the act of placing it on a table and attempting to comb or brush its coat out, particularly if the coat is matted at all. This then produces an angrier cat and a more stressful situation for both cat and groomer. A stressed cat can become a dead cat very quickly. Repeating this process every few weeks (because the mats continue to present themselves when degreasing and blow-drying are not done) is a great way to torture a kitty and possibly kill it. Cats are easily distracted. This works in our favor when de-matting. I use a Catty Shack Vac to dry every cat I groom. The circulating air movement causes most of the cats to totally relax, even the highly aggressive ones. Any de-matting that needs to be done, can then be accomplished with minimal effort on the part of the groomer and minimal discomfort for the cat, especially when the high velocity dryer does most of the work by blowing out or loosening the tangles and mats. I’m not making this up! 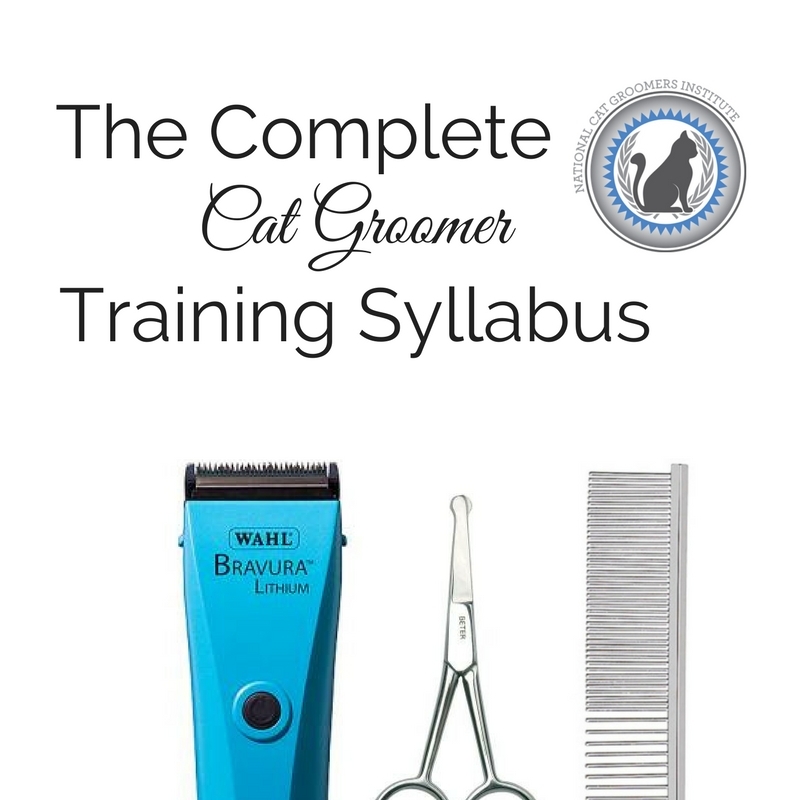 Every student who has attended our school can attest to this as I have demonstrated it over and over again, and the students have experienced it personally on a wide variety of felines, during class days of hands-on grooming. Regular bathing and blow-drying will prevent mats and pelts. I know this to be true because I’ve lived it for the past 13 years. If a good degreasing bath is done on regular basis (4-6 wks for most cats) and the coat is thoroughly blown out with a high velocity dryer, matting becomes a thing of the past. It is important to also comb out the coat thoroughly once it is dry, to remove any loose hair that is still hanging around. I have a guarantee that I offer all clients: if they allow me to groom their cat on the prescribed frequency (normally 4-6 weeks), I will guarantee their cat never gets matted or pelted. I offer a free groom if I am wrong. And in all these years, I have never had to give away a free groom because of that. If I did not bath and blow-dry the cats, this would not be the case. Grease would build up, dead coat would build up and mats would form. Simply combing or brushing the cat’s coat out every few weeks does nothing to remove the mat-causing factors (grease and loose hair). Instead, I would be torturing the cats on a bi or tri-weekly basis and never solve any problems. 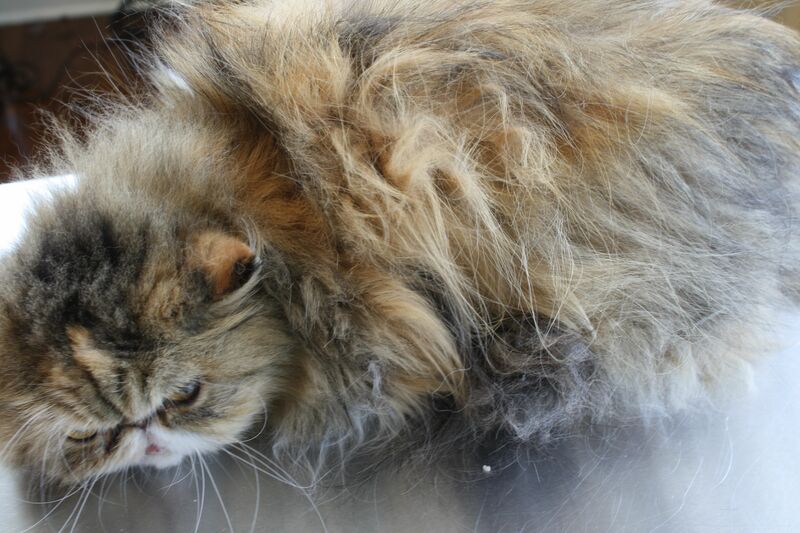 In addition, combing or brushing a greasy, icky coat moves the grease and ick all over, creating an even bigger problem in time and charging a customer money to send home a dirty, smelly cat. This is not professional grooming. This is inhumane. And really, when you get down to it, it’s a lot like stealing – charging money for something you’re not really doing. Kitty is pelted. He has thin skin and is aggressive and hates clippers. He can’t be sedated because of his age. The pelt will only come off by using clippers to remove it. Shaving is dangerous because the cat’s skin is so thin from age and/or health issues. The risk of nicking or cutting the cat is very high. Shaving the pelt off requires using a clipper blade very close to the cat’s skin, and sometimes the ability to see what is underneath is inhibited by the pelt. In addition, the cat’s temperament makes him very disagreeable to the shaving process under normal conditions. How much more stressful when it involves lifting and pulling on a tight pelt that has created open sores underneath! This bald spot of irritation was underneath matting. The mats pull the hair so much, that it causes hair loss. If the pelt isn’t removed the cat will die. It might take a few more weeks or months. But eventually the cat will die. And it will be a long, painful death, filled with tremendous suffering as the cat becomes septic and rots from the inside out. Sometimes this happens because the cat owner is ignorant of their cat’s grooming needs. This is not the person’s fault. We have heard for way too long the myths that “cats groom themselves” or “cats hate water.” Perpetuating these myths is a disservice to cats and their owners. If anyone is telling you that cats don’t need grooms that consist of a real bath and blow-dry, then they do not know what they are talking about. One has to consider if one speaking such nonsense is afraid to actually groom cats or if they simply don’t know what they are doing and thus have had bad experiences. Education is the key to prevention. If you don’t understand what I’m talking about, then how can it be effectively communicated to your clients so that they understand it? Training is also vitally important. If a cat is mishandled, the outcome can be devastating. Education and training makes all the difference! It can turn a bad scenario into a productive and hopeful one. It is our job to ensure that this is happening each and every time. Let’s make the industry better by being truly professional and humane. Let’s make the world better one cat groom at a time! 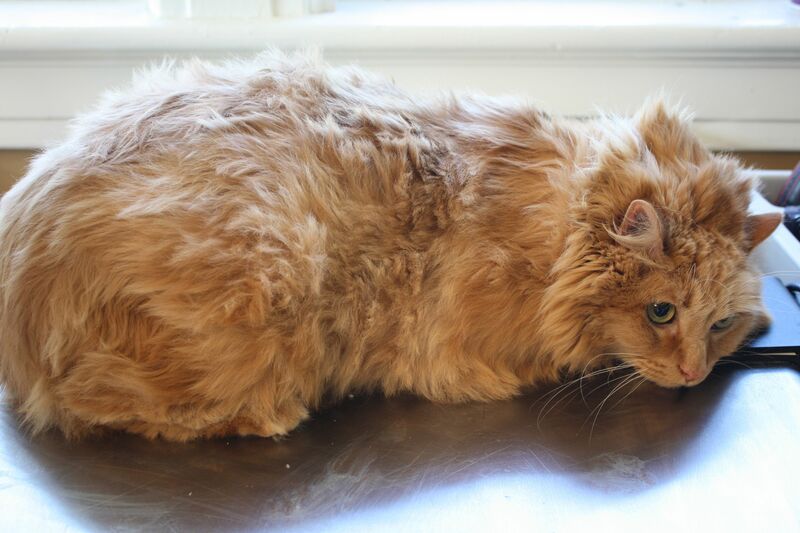 This DLH Red Tabby is in need of a full groom and haircut! 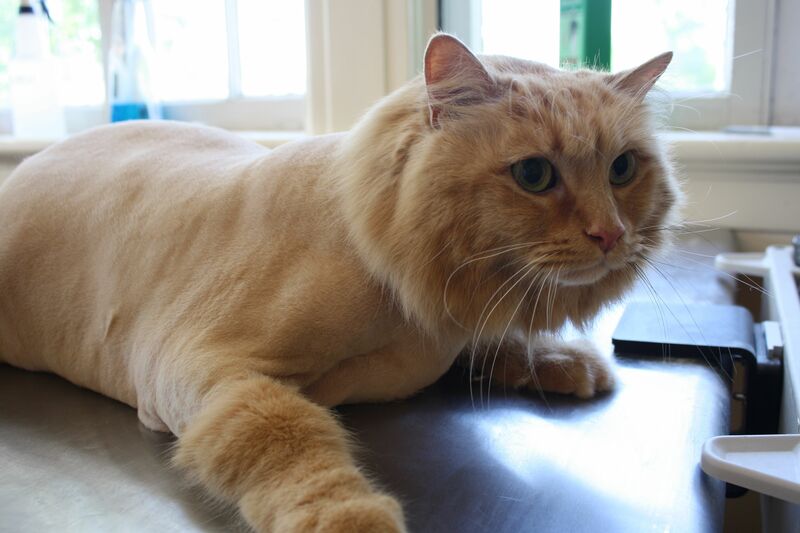 After a bath, blow dry and Lion Cut, this DLH Red Tabby looks stunning! 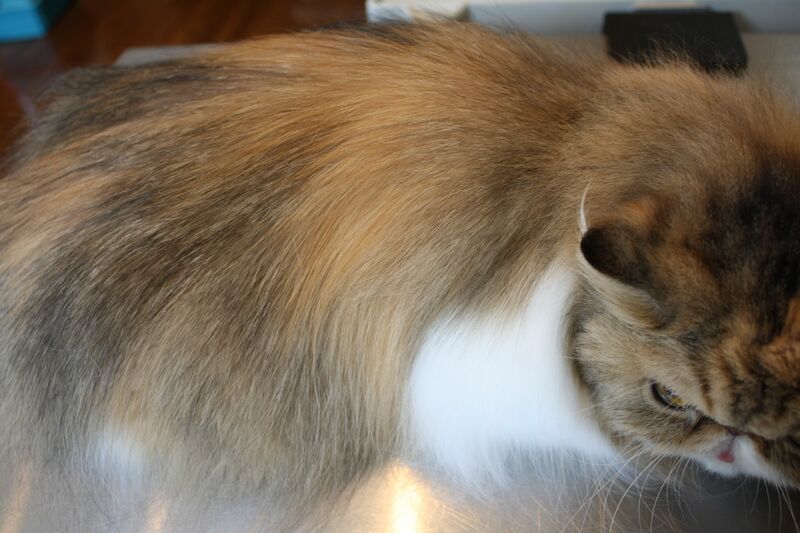 Luckily this Brown Patched Tabby and White Persian is not so matted the hair needed to be shaved off. A regular grooming appointment would keep them looking top notch all year round. After a Full Coat Groom, which include a degreasing bath and blow dry. 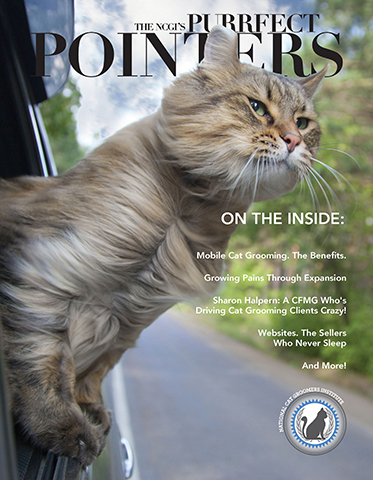 If you are a cat owner looking for a professional groomer in your area that specializes in cats, check out our map of NCGIA Members and Certified Feline Master Groomers at www.nationalcatgroomers.com. As a professional groomer, it is important to get clients on a regular grooming schedule to keep their cats in great condition. But how is this done? Get our totally free PDF with the 3 steps we used to get our clients off the once-a-year groom mentality and onto our schedule once a month. Hit the red button to get it now.